Eighty-something crooner Tony Bennett has made a habit of recording duets with much younger artists such as Lady Gaga and the late Amy Winehouse. Intergenerational duets, however, are nothing new. Bing Crosby was 74 years old in September of 1977 when he and his family and singer Rosemary Clooney embarked on a concert tour of England. The tour included two weeks at the famed London Palladium. While in England, Crosby recorded his final album, Seasons, and his last television appearance, a Christmas special. 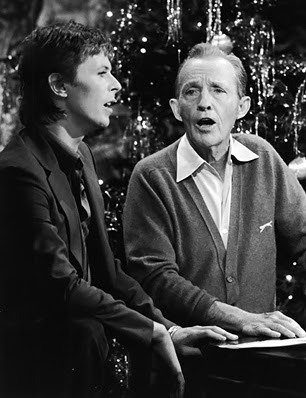 The special was called Bing Crosby's Merrie Olde Christmas and Bing's guest star was 27-year-old British rock star David Bowie. The two singers recorded a duet of "The Little Drummer Boy" and "Peace on Earth" for the show. They taped the segment in London on September 11, 1977. The original plan had been for Bowie to sing "The Little Drummer Boy" along with Bing. David, however, did not feel comfortable with the song and his voice did not adapt well to it. Composer/lyricists Buz Cohan, Larry Grossman and Ian Frasier quickly whipped up "Peace on Earth" which suited Bowie's voice much better. Bing and Bowie met the morning of the taping, rehearsed for an hour and finished their duet in only three takes. Crosby and Bowie made an unlikely pair. They were men of different generations and different lifestyles. The flamboyant Bowie, known for wearing makeup on stage, appeared much more conservative on Bing's special. There was nary a hint of his androgynous persona because he was scrubbed clean of his usual mascara and fingernail polish. 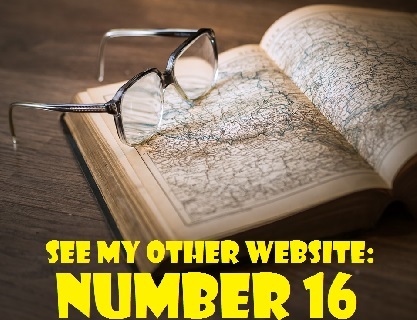 For the TV special, Crosby wore a comfortable cardigan and the usually outlandish Bowie was almost unrecognizable with his neatly-combed hair and royal blue blazer. Bing had no idea of who David Bowie really was. If he had been better informed, it is almost certain that the collaboration wouldn't have taken place. In an interview four days after the filming of the Christmas special, Bing described Bowie as "a clean cut kid and a real fine asset to the show. He sings well, has a great voice and reads lines well. He could be a good actor if he wanted." Crosby, of course, was unaware that David Bowie had already starred in the 1976 film The Man Who Fell to Earth. If Bing were so uninformed about David Bowie, how then did the pairing of this proverbial odd couple happen? What brought about their collaboration? Bing, it seems, wanted a young star to appear on his Christmas special and someone mentioned the name of David Bowie. Although Bing had never heard of David, his children certainly had. An invitation was sent to Bowie and he accepted enthusiastically. Surprisingly, he was a fan of Bing's. After his tour of England was completed, Bing Crosby flew to Spain on his own. His intention was to do some hunting and golfing there. On the evening of October 14, 1977, however, Crosby, who had a heart condition, collapsed after playing 18 holes of golf near Madrid. He died of a massive heart attack. Bing's final Christmas special aired on November 30, 1977, just weeks after his death and his duet with David Bowie generated a great deal of public interest. It became a perennial music video, best-selling single and a CD-ROM. In the June 5, 1999 issue of TV Guide, the Crosby-Bowie performance was selected as one of the 25 best television moments of the 20th century and their duet turned out to be a great Christmas song. Yet, if Bing had known more about David Bowie and his underground lifestyle, it probably wouldn't have come about. To watch a video clip of David Bowie on Bing Crosby's Merrie Old Christmas, click on the link below.